Designed by Sean Murray, winner of the BBC's Great Chelsea Garden Challenge 2015, the garden will provide a place for recreation and enjoyment for the children and families who use the hospice services. Sean has designed an attractive therapeutic garden, which will attract wildlife as well as provide a safe and peaceful sensory experience for all who visit. This project has seen generosity from grant-making trusts, along with support from nearby Cowell’s Garden Centre, Johnsons of Whixley for plants as well as funds raised by those taking part in Garden Re-Leaf Day, Kew Green Hotels and many others. 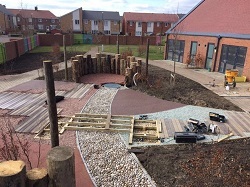 This new Greenfingers garden, with its interactive water feature, sensitive planting and sheltered areas will provide families with an invaluable outside space for respite and relaxation, as well as stimulating features that can be used for therapies and reflection.